Available on the Illustra Pro 2, 3 and 5 megapixel mini-dome IP camera series, Illustra video intelligence analytics automatically detect alarms for key suspicious events. With the analytics on the edge, Illustra creates a cost-effective solution without the need for a dedicated analytics server. These analytics are easily integrated with exacqVision network video recorders and VMS software and American Dynamics VideoEdge network video recorders and victor video management system. “These new sophisticated onboard video analytics gives our customers a valuable tool to minimize operator’s time searching video and improve operational efficiencies, delivering a better customer experience,” said James Voss, Senior Product Manager, Tyco Security Products. Object removed identifies objects that have been taken away from a specific region. Linger alarm automatically detects loitering in an area for longer than an extended period of time. Abandoned object discovers when an object has been left alone for a predefined amount of time. Enter/exit triggers an alarm if an object or person crosses a specific detection zone. Crowd formation finds a specific amount of people forming in a predefined space. Dwell analysis alerts users if an object or person has spent a significant amount of time in the same place. 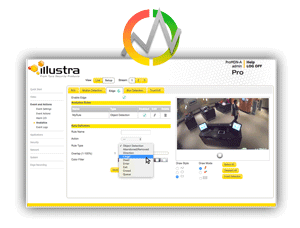 Through the intuitive Illustra camera configuration page, users can easily activate and save video intelligence analytic rules. Each analytic rule can be given a unique name and easily drawn over the desired area to monitor. For more information on the new Illustra video intelligence analytics, visit www.illustracameras.com. Illustra develops some of the industry's most technologically advanced IP cameras. These technologies help retailers stop crimes that affect their bottom lines, and schools provide peace of mind to parents and students. Security systems built with Illustra IP cameras assist governments in securing ports and borders, and hospitals ensure the safety and privacy of their patients.